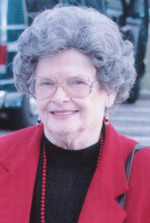 D. Jane Strickling, age 95, of Woodsfield, Ohio died Wednesday July 11, 2012 at her home. She was born July 19, 1916 at Richfork Monroe County Ohio a daughter of the late Richard & Leona Daugherty Bates. Jane was the former owner of the Monroe Bowling Lanes in Woodsfield. She was a member of the Church of Christ and a 65 year member of the Woodsfield Chapter #268 Order of Eastern Star. Preceded in death by her husband who she married May 3, 1934; Guy Strickling, 16 brothers and sisters, and two grandchildren. Friends will be received from 4 – 8 p.m. Friday and from 1 p.m. until time of funeral service at 2 p.m. Saturday July 14, 2012 at the Bauer-Turner Funeral Home 100 S. Paul St. Woodsfield, Ohio with Chuck Schultheisz officiating. Interment in the Oaklawn Cemetery Woodsfield.